Samson Munn's parents were European Jews. His mother, from Aurich, Germany, survived Auschwitz, Gräben and Bergen-Belsen. His father, from Lodz, Poland, survived the Lodz ghetto, Auschwitz and Görlitz. Citizenships: Israel, Poland, Germany and the U.S.A. In 1992, Samson took part in Dan Bar-On's To Reflect and Trust, sons and daughters of Nazi perpetrators meeting with daughters and sons of Holocaust victims. Samson began a similar group in 1995, The Austrian Encounter (which still meets), and has worked elsewhere. Organized and facilitated the first international meeting of representatives of such groups (Boston, 1996). Samson (a radiologist) authored a review article in Journal of Humanistic Psychology. He has also written seven chapters in five books, and co-authored a chapter in still another book, all published between 1998 and 2016. Dr. Munn lectures in Germany, Austria and the U.S. (and occasionally elsewhere). Approved 2011 for candidacy to the Fulbright Specialist roster for six years. Specialization area: Peace and Conflict Resolution Studies. 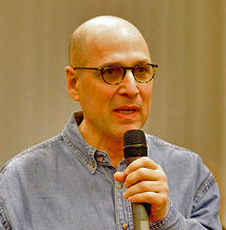 Dan Bar-On's work that included Samson, Samson's own work and Samson personally, have been subjects in four documentary films, and many newspaper articles and radio interviews internationally. B.A. (psychology), 1973, University of California (Berkeley). M.D., 1978, Boston University. Residency, Tufts Medical Center; fellowship, Boston V.A. Medical Center. Board-certified in radiology in the U.S. (and the equivalent in England). Adjunct Associate Professor, Tufts University School of Medicine, and Clinical Associate Professor, UCLA School of Medicine; and, Chair, Department of Radiology, Harbor-UCLA Medical Center (in Los Angeles).